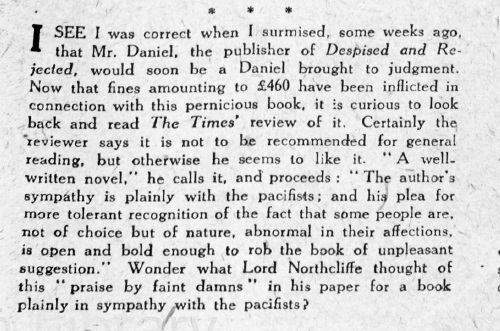 I’d have thought that one thing one could say in favour of Northcliffe was that this reviewer at the Times Literary Supplement felt he could give praise where it was due, despite the proprietor’s opinions and the position he held in the government. That nasty man James Douglas (who almost certainly wrote this paragraph, though not the rest of the Looker-On column, which is mostly light and gossipy) is clearly trying to stir up trouble here. I’ll write more about London Opinion tomorrow. 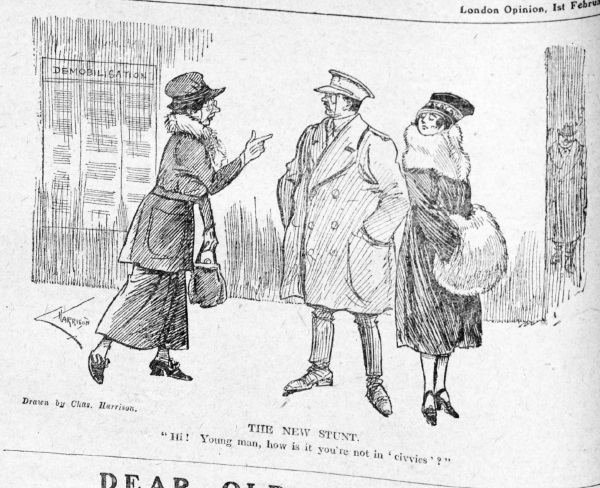 This entry was written by George Simmers and posted on January 14, 2019 at 10:08 pm and filed under attitudes, censorship, Magazines with tags James Douglas, London Opinion, Northcliffe, Rose Allatini, Times Literary Supplement, White Feather. Bookmark the permalink. Follow any comments here with the RSS feed for this post. Post a comment or leave a trackback: Trackback URL.